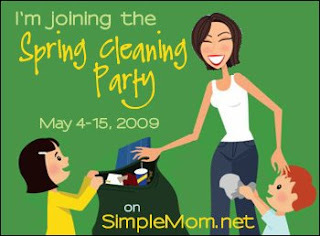 Valerie at Home: Spring cleaning! It's going to happen! Between Mr. at Home's busy work schedule, my busy "work" schedule, K's extra schoolwork schedule, and my being sick (which was NOT scheduled), the housework has fallen by the wayside. I've spent some time this week trying to catch up some, but it's daunting, not to mention just flat depressing, to look at the big mess and calculate how much time it's going to take to get it all back under control. I love having a clean house. I hate what it takes to get it there. When I was reading blogs today, I came across a little challenge. A blogger is organizing a spring cleaning party. For 2 weeks, she's posting her own efforts and challenging others to join her by posting their own before and after photos. She promises to break things into manageable chunks that won't take too much time each day. The timing is perfect! My house is in need of cleaning, my motivation is in need to some motivating, and my pastor has asked each of us to hold a garage sale this summer to raise money for missions. Having someone tell me what I need to do each day will help me to get everything done. Having the accountability of telling you all about it will help me get everything done. So I spent my $7 and bought the e-book with its task lists and explanations. And it looks awesome, by the way. I'm adding a couple of cleaning supplies to the shopping list and getting my boxes ready for Mondays declutter. Who's going to do it with me? Have you noticed after several years of marriage that your husband came from a family of inveterate pack rats? Good luck!